"Life is what happens while you're busy making other plans." The John Lennon lyric is one I'm fond of quoting, accompanied by a shrug of my shoulders when weighing in on the mysterious ways of the world. This week the plans I'd made included finishing Catching Fire, maybe see the crazy popular movie starring Jennifer Lawrence this opening weekend, and post my thoughts here. But life, or rather, the end of life, happened. 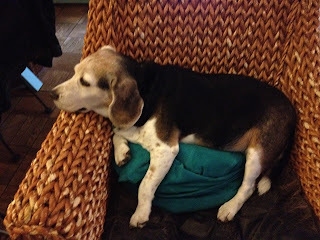 Our beautiful beagle, Charlie, passed away on Thursday. He was diagnosed with CHF a few months ago after my husband took him to see the vet for what we thought was a simple cough. We were stunned at the diagnosis of Congestive Heart Failure; so stunned I don't think we quite believed it. There's no cure for the disease; the vet prescribed a handful of meds to manage the symptoms and intellectually we told ourselves we understood where the journey was going. Still when the meds kicked in and the first thing that happened is that the cough went away, we couldn't help sighing with relief, thinking the worst was over. It wasn't. The years passed with Russell growing up and Charlie growing old along the way. It hasn't been all sunshine and wagging tails, Charlie's original owners gave him up as a young pup when they got a divorce. Right from the start Charlie had abandonment issues, becoming frantic when left alone, barking and destroying what lay between him and a pathway to us. Like scrabbling away at the wall next to the door, digging through the drywall in an attempt to get out and, we like to think, get to us. I remember coming home one day after a quick trip to the market, to find a gaping hole in the wall, and Charlie spent with exhaustion, his foreleg cut, lying beside the door, the floor littered with a small pile of dust and debris. That was a bad time and there were others but the good times outweighed them by far, over and over again. We learned to ease his separation anxiety with a citronella collar for those times when we had to leave him alone. We took the bad with the good. We loved him. And that's how it's been, loving him, all these years. It's hard to watch your pet slowly decline; the lethargy, the loss of appetite, the labored breathing, the weakened legs that barely support him as he wobbles out to urinate. He spent the past couple of weeks staying close and mostly just shifting positions, trying to get comfortable. Last week he wouldn't eat, vomiting up the little we did manage to get into him along with his meds. Thursday, when Charlie tried to stand up and walk, his body continually betrayed him, sending him careening sideways to to the floor. He looked at us with those soft beagle eyes pleading what the f!#k is going on? We couldn't bear the thought but knowing it was probably time, Russell and I took him to the vet. Dr. Ban told us we were right and we were giving him a gift. They may say that to everyone who has to make the awful decision to put their dog to sleep but we appreciated her comfort and support. Feeling sad that my husband, working out of state, couldn't be there with us we got him on the cellphone and held it up to Charlie's ear so MLH could at least say goodbye while Russell and I hugged him and stroked those velvety ears. It was painful for us but a peaceful, painless transition for Charlie, the best dog that ever lived. We all know we'll be sad for awhile, and that we'll miss his warm body curled up next to us on the couch or straddling our feet on the floor. It will take some time to get used to him not being underfoot and begging for treats the minute any of us headed into the kitchen. It will take awhile to get used to the empty corner where his food bowl and water used to be, and to figure out what to do with his dog bed. It will take some time. Late yesterday afternoon and feeling bluesy, I couldn't help but notice the sunset. It was one of those glorious skies, dappled with clouds against a still blue background tinged with pink and gold and a few dazzling rays of light almost as if the heavens were opening. 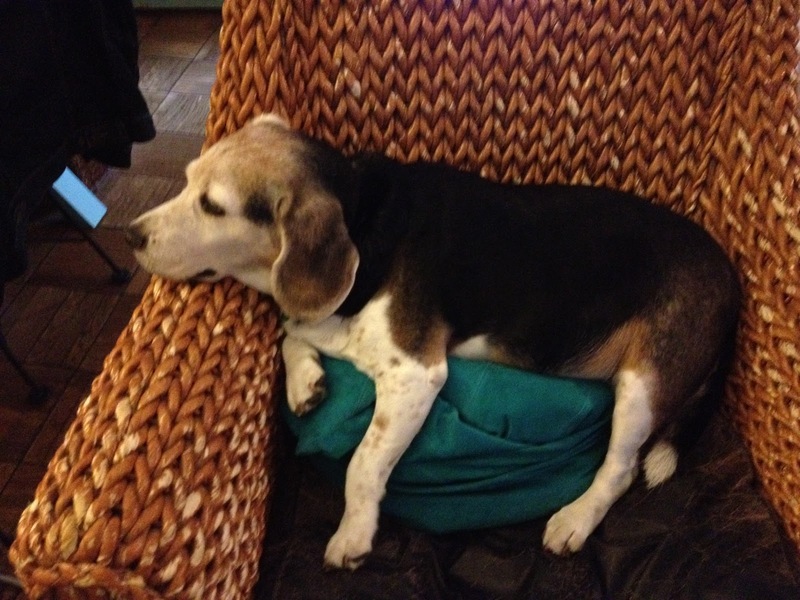 And there was my Cloud Charlie in the sky, front paws outstretched, his beagle snout pointing heavenward. I ran and grabbed Russell nervous that he would think his mom had gone off her rocker but I needed Russell to see Charlie too and he did, instantly. Charlie in the sky, surrounded by the glory, smiling and floating towards the light. My friend Laura told me it was a sign that he's safely landed in heaven. I love the thought but I told her I struggle with the concept while I guessed my dog would find out if heaven exists before I did. And that if it does I sure hope Charlie will find a way to let me know. Laura asked if I'd read Heaven is for Real reminding me that a film starring Greg Kinnear was coming. I have not. I'd heard of the book vaguely but hadn't given it much thought; honestly, in the past it had sounded kind of sappy. 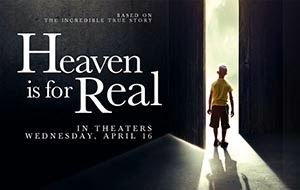 Heaven is for Real is the true story of a little boy who claims to have been to heaven after a near death experience. Just watching the trailer is an emotional journey. I don't know if heaven exists, or if reading the book or seeing the film will convince me that it does, but today with the image of Charlie up in the heavens, I'd sure like to think so. Thank you, dear Laura, for helping me see a little light. And Russell for being there with me, being strong and giving me strength. And MLH for wanting to be there so badly. I love you all.